London - Mesut Ozil produced a major second-half contribution as substitute Olivier Giroud scored twice in Arsenal's 5-0 Premier League victory at home to Huddersfield Town on Wednesday. 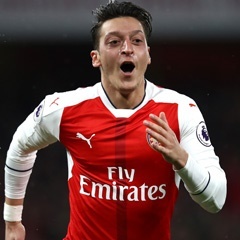 It was the Gunners' seventh win out of seven at the Emirates Stadium in the league this season and Ozil was influential with two assists and a goal in a four-minute period as the Gunners remained in the top four. Alexandre Lacazette gave Arsenal an early lead before Ozil set up Giroud and Alexis Sanchez before scoring himself. Giroud then added a late fifth goal. Arsenal manager Arsene Wenger played arguably his strongest side, with Ozil returning alongside Lacazette and Sanchez. But in this first meeting between these two sides since January 1972, Huddersfield manager David Wagner made six changes to his starting XI. It was a decision that appeared to backfire when Arsenal went ahead as early as the third minute when a superb move resulted in Lacazette's seventh goal for Arsenal and fifth at the Emirates. Granit Xhaka’s pass was flicked into the path of the Frenchman by Aaron Ramsey and he produced an expert left-footed finish to leave Jonas Lossl with no chance. The hosts could have extended their lead as Ramsey shot over when well placed but at the other end Mathias Jorgensen headed over the bar from Chris Lowe's free-kick. Lacazette continued to put Huddersfield under major pressure and he was unfortunate not to make it two when his shot from the angle was cleared off the line by Martin Cranie, Sead Kolasinac unable to get a proper connection on the rebound. Wenger's side had been dominant but they may have gone in at the break all square at 1-1. Shkodran Mustafi tangled with Steve Mounie in the penalty area but no penalty was awarded while Collin Quaner was unable to get a shot away after Laurent Koscielny recovered after the Huddersfield striker had appeared to go through on goal. Lacazette failed to re-appear for the start of the second half, with Giroud coming on in his place. Ozil saw his shot deflected harmlessly after good play by Sanchez down the left but at the other end Quaner was only denied by the feet of Petr Cech after a determined run into the area. The game was becoming an open one and it took a last-ditch Christopher Schlindler block to deny Giroud and shortly afterwards Cech was fortunate to see his punch hit the bar after Mounie had caused problems in the area. Arsenal should have finished the game off when Giroud rounded Lossl from Ramsey's pass but he hit the post and then fired the rebound into the side netting. A few nerves started to creep in around the Emirates but it was Ozil who responded with a brilliant contribution with two assists and a goal in four minutes. First he exchanged passes with Sanchez before setting up Giroud who could not miss in the 68th minute. Just a minute later and Ozil’s cross from the right was volleyed home by Sanchez. Wenger had said on the eve of this game that the pair would remain at Arsenal for the rest of the season and they responded to the veteran manager's comments in the best way possible. Ozil scored a well-deserved goal in the 72nd minute as he finished in cool fashion following a slide-rule pass by Ramsey. With Huddersfield well beaten by this stage, Giroud went on to get his second goal of the night three minutes from time as he pounced on a loose ball after Kolasinac had run into the box.